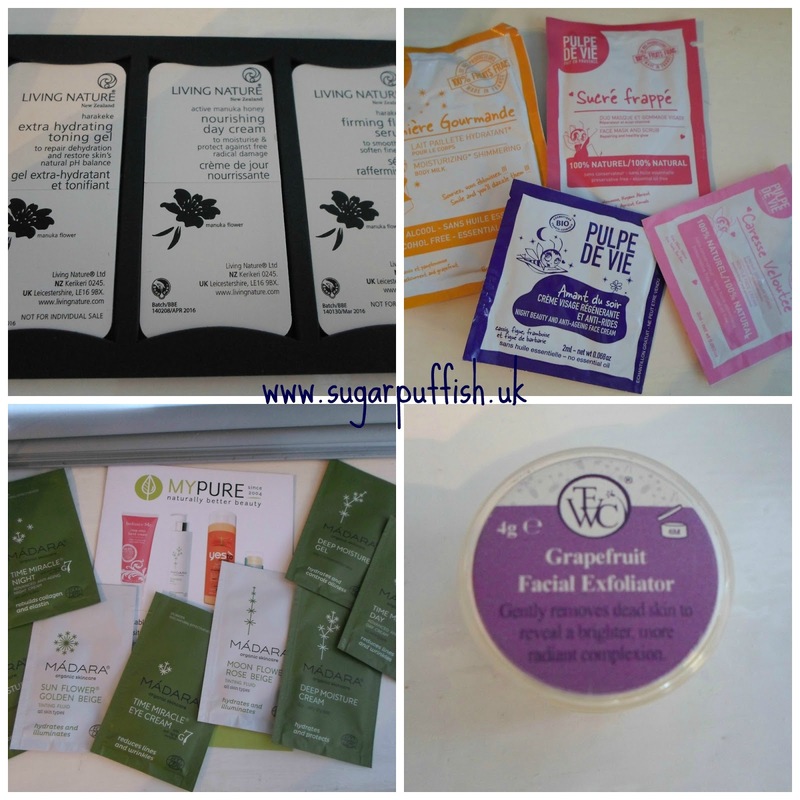 In the goody bag from the October Meet Up I received several sachet samples which I have been working my way through. Of course, I will only provide first impressions of these products since most sachets only contain enough product for a couple of applications. The Just Face Cream, is fragrance free so that sparked my interest. I would consider buying the full size but I hesitate because it contains Phenoxyethanol. Not an ingredient I avoid entirely but one I use with caution. I had previously reviewed the cleansing mousse back in 2012 and I wasn't impressed. With continued use, I did not feel it was appropriate for my skin type but it's fine for a one off. Pulpe De Vie is a fun and fruity brand. The scents are delightful but slightly overpowering for my own personal taste. That being said I did enjoy using up the samples as the creams felt pleasant on my skin (I passed along the body milk to my sister). The mask & face scrub is a novel product to use. A three step process - apply to dry skin and leave 5 minutes, massage gently to cleanse and exfoliate, then add water to turn the mask into a milk which can be washed away. Would I buy full sizes? I am undecided, packaging and scents made me feel these products could be more suited to teens/young adults. The sample collection covered different skin types so I selected the ones appropriate to me and passed on the rest. I am not new to the brand and have bought Madra products in the past. The one issue I have with this brand is the scent, it’s strong and a little unusual. The creams were nice to use but the only one that stood out for me was the Deep Moisture Cream. I would consider buying a full size bottle. Madara is a good brand for those who are Vegan and I noticed the claim (on their website) that products are nut free. This exfoliator contains fine scrub particles but they are still a little too abrasive for my sensitive skin. As this product is a balm consistency, it is heavy with oil which does leave a greasy residue. I disliked this sensation on my skin and found it difficult to remove. I would be more inclined to use this on my body rather than my face.